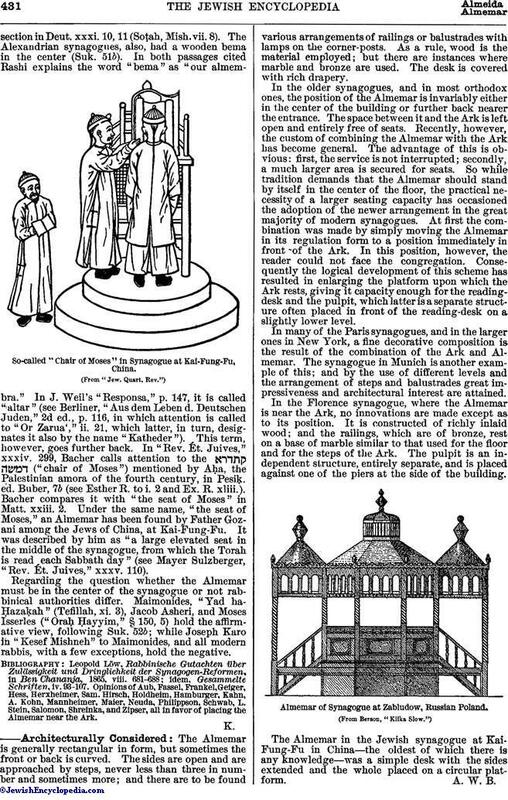 Corrupted from the Arabic al-minbar, "the chair," "the pulpit," is an elevated platform in the synagogue, on which the desk stands for reading the lessons from the Pentateuch and Prophets. In the synagogues following the Spanish ritual the prayers are also read from it. In Russia it still goes by its Talmudic name , which is simply the Greek βῆμα, a speaker's tribune. Being the counterpart of the wooden pulpit from which Ezra read the Law to the assembled people who stood all around him (see Neh. viii. 4), its proper place seems to be in the middle of the synagogue (see the literature in "Ben Chananja," viii. No. 39, pp. 681-688; "Die Almemarfrage" by Leopold Löw, reprinted in "Gesammelte Schriften," iv. 93-107), but it has in modern times often been moved forward close up to the Ark. The Almemar or Reading-Desk of the Synagogue at Florence, Italy. The Septuagint reading in the passage in Neh. is βῆμα for . In the 'Azarah, or Temple hall, a bema, or wooden pulpit, was erected for the king when, every seventh year, he read the prescribedsection in Deut. xxxi. 10, 11 (Soṭah, Mish. vii. 8). 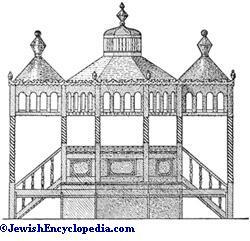 The Alexandrian synagogues, also, had a wooden bema in the center (Suk. 51b). In both passages cited Rashi explains the word "bema" as "our almembra." In J. Weil's "Responsa," p. 147, it is called "altar" (see Berliner, "Aus dem Leben d. Deutschen Juden," 2d ed., p. 116, in which attention is called to "Or Zarua'," ii. 21, which latter, in turn, designates it also by the name "Katheder"). This term, however, goes further back. In "Rev. Ét. Juives," xxxiv. 299, Bacher calls attention to the ("chair of Moses") mentioned by Aḥa, the Palestinian amora of the fourth century, in Pesiḳ. ed. Buber, 7b (see Esther R. to i. 2 and Ex. R. xliii.). Bacher compares it with "the seat of Moses" in Matt. xxiii. 2. 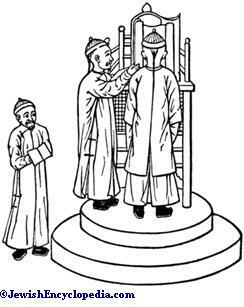 Under the same name, "the seat of Moses," an Almemar has been found by Father Gozani among the Jews of China, at Kai-Fung-Fu. 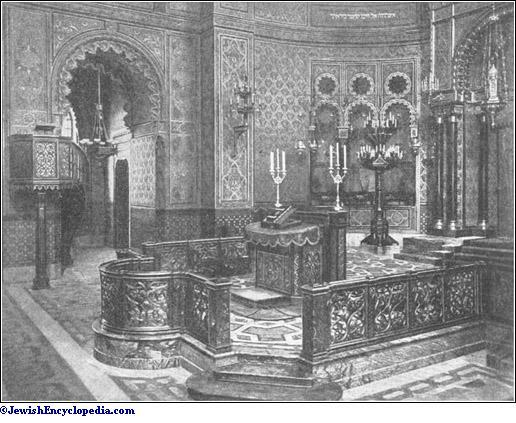 It was described by him as "a large elevated seat in the middle of the synagogue, from which the Torah is read each Sabbath day" (see Mayer Sulzberger, "Rev. Ét. Juives," xxxv. 110). So-called "Chair of Moses" in Synagogue at Kai-Fung-Fu, China. Regarding the question whether the Almemar must be in the center of the synagogue or not rabbinical authorities differ. Maimonides, "Yad ha-ḤazaḲah" (Tefillah, xi. 3), Jacob Asheri, and Moses Isserles ("Oraḥ Ḥayyim," § 150, 5) hold the affirmative view, following Suk. 52b; while Joseph Karo in "Kesef Mishneh" to Maimonides, and all modern rabbis, with a few exceptions, hold the negative. idem, Gesammelte Schriften, iv. 93-107. Opinions of Aub, Fassel, Frankel, Geiger, Hess, Herxheimer, Sam. Hirsch, Holdheim, Hamburger, Kahn, A. Kohn, Mannheimer, Maier, Neuda, Philippson, Schwab, L. Stein, Salomon, Shreinka, and Zipser, all in favor of placing the Almemar near the Ark. The Almemar is generally rectangular in form, but sometimes the front or back is curved. The sides are open and are approached by steps, never less than three in number and sometimes more; and there are to be found various arrangements of railings or balustrades with lamps on the corner-posts. As a rule, wood is the material employed; but there are instances where marble and bronze are used. The desk is covered with rich drapery. In the older synagogues, and in most orthodox ones, the position of the Almemar is invariably either in the center of the building or further back nearer the entrance. The space between it and the Ark is left open and entirely free of seats. Recently, however, the custom of combining the Almemar with the Ark has become general. The advantage of this is obvious: first, the service is not interrupted; secondly, a much larger area is secured for seats. 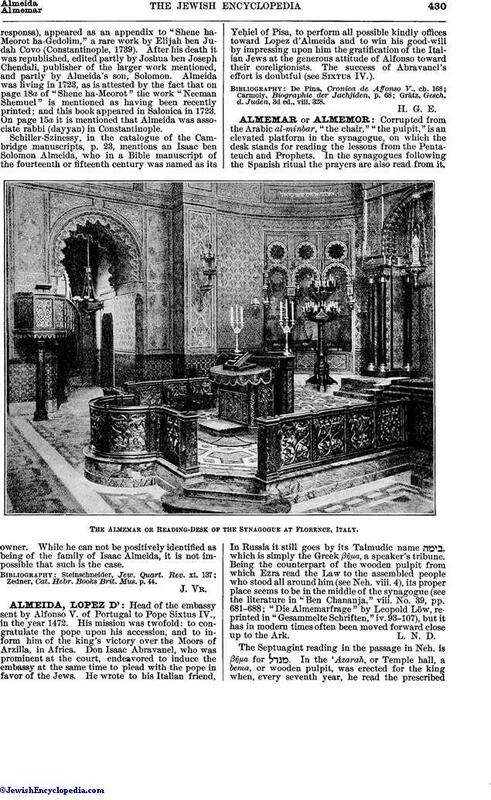 So while tradition demands that the Almemar should stand by itself in the center of the floor, the practical necessity of a larger seating capacity has occasioned the adoption of the newer arrangement in the great majority of modern synagogues. At first the combination was made by simply moving the Almemar in its regulation form to a position immediately in front of the Ark. In this position, however, the reader could not face the congregation. Consequently the logical development of this scheme has resulted in enlarging the platform upon which the Ark rests, giving it capacity enough for the reading-desk and the pulpit, which latter is a separate structure often placed in front of the reading-desk on a slightly lower level. In many of the Paris synagogues, and in the larger ones in New York, a fine decorative composition is the result of the combination of the Ark and Almemar. The synagogue in Munich is another example of this; and by the use of different levels and the arrangement of steps and balustrades great impressiveness and architectural interest are attained. In the Florence synagogue, where the Almemar is near the Ark, no innovations are made except as to its position. It is constructed of richly inlaid wood; and the railings, which are of bronze, rest on a base of marble similar to that used for the floor and for the steps of the Ark. The pulpit is an independent structure, entirely separate, and is placed against one of the piers at the side of the building. The Almemar in the Jewish synagogue at Kai-Fung-Fu in China—the oldest of which there is any knowledge—was a simple desk with the sides extended and the whole placed on a circular platform. Almemar of Synagogue at Zabludow, Russian Poland. (From Berson, "Kilka Slow.")A. W. B.